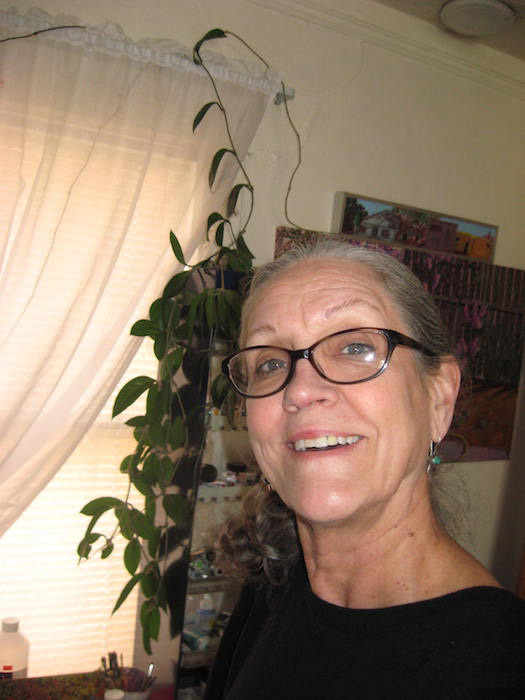 Polly Jackson - Fine Artist and educator specializing in Painting, residing in Albuquerque, New Mexico. Professional Fine Artist with over thirty-eight years of painting. Work shown in the Round House Capitol Arts Foundation Collection (permanent collection), Santa Fe, NM, The Albuquerque Museum, Albuquerque, NM, and private collections around the world. Her work has also been shown 11/6/99 on HGTV, Interiors of Design. Her art was selected for the 2002 poster for The Old Pecan Street Festival; Spring, Austin, TX. In 1975, Sunstone Press of Santa Fe, NM issued four of her greeting card designs, and Gargoyles, Inc. sold her ceramic tile designs. Jumpin' Junipers Publishers of Santa Fe, NM has issued a poster and a greeting card with her designs. She teaches at UNM Continuing Education, various senior centers and Artisan Art Supply Store in Albuquerque, NM. Previous teaching experience in Austin, TX includes Laguna Gloria Austin Museum of Fine Arts (3 years), Austin Community College (2 years), Painting with Acrylics, Painting with Oils, Pastels and En Plein Air Painting through The University of Texas Informal Classes (8+ years), painting with acrylics at Gardner-Betts Juvenile Facility (5 years), and various private classes.